A bit of a change of pace for this month!!! Every neighborhood needs a firehouse. And no one does one as cute as the one made by Bliss!!! From the heavy planked doors and stained glass windows, and all the way up to the cute bell tower, this building just eeks charm. 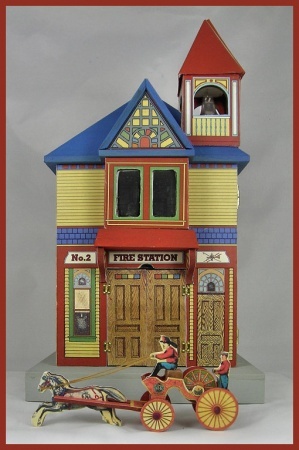 In addition to the firehouse, we are including all furnishings and accessories shown in the photos, including the replica Bliss horse drawn hose wagon and my version of a pump wagon. Be sure and check out the card game in progress on the upstairs table and you can see that our firemen left in the middle of a great hand! 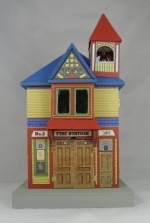 The"Fire House #2" measures 7" to the roof peak. 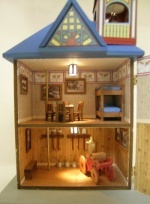 It is lit with battery operated LED lights on each floor, and has an on/off switch hidden in the base. Everything you see in the photos is included. Students will provide simple and common tools, paints and glue. This will be the last building in the series for 2011. We will resume the series beginning again in January, to make time for some very special Christmas projects that are on the way. The"House 571" measures6 1/2" to the roof peak. 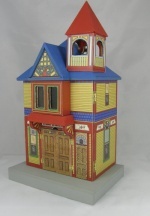 It is lit with battery operated LED lights on each floor, and has an on/off switch hidden in the base. Everything you see in the photos is included. Students will provide simple and common tools, paints and glue. An extensive online tutorial will be provided with color photos and written instructions for each and every step of this project. The tutorial can be used online or downloaded and printed from the provided pdf file. Please note that due to in-attendance, I am no longer holding online chat sessions for my projects.. I've been told that our instructions are so good that attendance at the chats was not necessary, so I am discontinuing that portion of my classes, however email assistance is available at all times should you need help. Kit for this project will begin shipping October 1, 2011. If you have any questions, drop us an email!